Shoreline Septic Systems and the property owners who manage them have a special role in preventing contamination of Long Island Sound and nearby water resources. 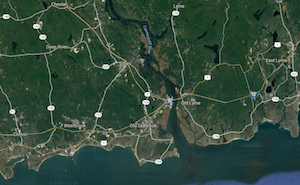 An individual’s actions on or around their property in Old Saybrook, Clinton and Old Lyme, for example, can affect not only their water quality but also that of their neighbors and those in other parts of the shoreline. Maintaining a septic system (both the septic tank and its drain-field) located near the shoreline requires more care than a similar system located away from a large body of water. The need to properly care for a septic system is even greater due to the potential negative impacts on our health as well as the ocean biomass: birds, fish, and plants which live within Long Island Sound. Soil type and nearness to both groundwater and surface water are two significant factors that can increase the risk of potential contamination from shoreline septic systems. Septic systems in clay soils have a higher risk of clogging and failing which potentially can cause nutrients and contaminants running off to the shore. Sandy soils such as those found near a beach may allow nutrients to move quickly down to groundwater before they are properly processed in the soil. 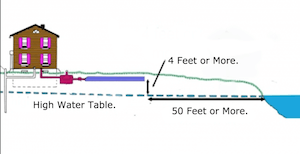 Because shoreline areas typically have high water tables and septic systems are often very close to the water, the potential to impact groundwater or surface water is significant. What’s more, along the shoreline native plants and wetlands are often replaced with lawns, beaches, and seawalls, giving pollutants less chance of being filtered thoroughly before reaching the water. Finally, erosion can also shorten the distance between the septic system and the water’s edge. This decreased area may lead to inadequate area to properly treat wastewater before it moves into surface water and/or groundwater. Have your septic tank inspected and pumped regularly by a licensed pumper. The general recommendation of how often to get your tank pumped is about once every 3-5 years. Of course, the right specific pumping schedule for you is based on the size of the septic tank, the number of individuals in your household and the amount of wastewater generated. Consider improving or upgrading your system if the amount of wastewater you generate is more than your septic system can handle. Since it is not easy to make such extensive changes, carefully consider all of the activities that generate wastewater in your home—cooking, bathing, flushing toilets, laundry, dishwasher, etc. This will help you come up with measures you can take to conserve water as much as possible. Install a vegetative buffer strip of deep-rooted plants between the end of your drain-field and the shoreline area. These plants can help absorb nutrients before they reach water. Take care not to plant deep-rooted plants in the area directly over your drain-field, as roots might cause damage to your system, which may result in wastewater that is not adequately treated. Construct the septic system as far away from the shoreline as possible if you are building a new home. Check with the local health department to determine specific requirements. Consider alternatives to a traditional septic system such as hooking up to a community sewage system or alternative disposal method. Check with the local health department to determine what options are possible. If you have concerns about your current septic system or are in the midst of purchasing a new home, we’d be happy to offer you an assessment of your situation. Please contact us for a complimentary conversation about how you might improve your septic system to minimize the potential for environmental impact.